Chris: Today’s episode is brought to you by Select Italy. Select Italy designs custom itineraries and books a whole range of products and services including fascinating tours, romantic weddings, or honeymoon trips. Along with ticketing services for museums and musical events in Italy. Visit selectitaly.com to learn more. Amateur Traveler Episode 501. Today the Amateur traveler looks at interesting neighborhoods, small bodegas, a history that may go back to Hercules, and the works of Antonio Gaudi, as we go to Barcelona in Spain. Welcome to the Amateur Traveler, I’m your host Chris Christensen. We’ll hear more from our sponsor later, but first let’s talk about Barcelona. I’d like to welcome to the show Lauren Elois who is coming to us from Devour Spain, the founder of Devour Spain, and come to talk to us about Barcelona. Lauren, welcome to the show. Chris: We have talked about Barcelona on the show before as Lauren is aware, but I want to make sure that listeners are. But we haven’t talked about it in such a long time that I wanted to talk about it again because it is a popular destination. But Lauren, in your opinion why should someone go to Barcelona? Lauren: Why shouldn’t they go to Barcelona? Barcelona is a fantastic city anytime of the year, which I don’t think many places can claim. The climate to start with is fantastic, so you’re almost guaranteed sunlight and lots of nice warm Mediterranean weather. And then, I mean, the food, the culture, the history, it’s one of those cities that really just mixes kind of all of these different elements so that you don’t just have to go if you’re really into the one thing or the other, you really can truly have this full experience when you’re in Barcelona. And you can go for two days or you can go for two months and you’ll still have things to do everyday. Chris: And you say you can do it at all times of year and our experience was, we went to Barcelona the first time in June, and the rest of Spain was just a tad warm in June but Barcelona was warm but more comfortable because it does have a little more breeze there, being on the water. Lauren: Yeah, we’re really lucky because Barcelona, it has such mild winters yet the same time the summer is also a lot more mild than if you’re, say, in Andalusia in the south of Spain or in Central Madrid, where the heat is so unbearable. So I think it’s fantastic that Barcelona is just a city that really has something special going on every month of the year. Of course it has a few weeks of rain here and there, but apart from that, it’s really just, weather-wise, a fantastic place to visit and to live and to spend some time. Chris: Excellent. What kind of itinerary would you recommend for someone who’s coming to Barcelona for the first time? Lauren: Well I definitely recommend staying at least almost a week, 5 days, a week. I think a lot of people, they travel to Spain and they try to cram it all in. Chris: [laughs] I laugh because we did that. We did the first trip to Spain that we did was the death march trip. We honestly tried, I think within 10 days we went to Madrid, Toledo, Sevila, Los Pueblos Blancos, Granada, Cordoba, and Barcelona, and Sevila. And I would never ever, ever, ever recommend you do that, especially in the heat of the summer, which is what we did. Lauren: That is intense. I’m surprised you’ve come back after that experience. Chris: My family never, almost never vacationed with me again after that. We had to change our rule and go to a two night minimum rule after that. Lauren: Yeah, yeah, two nights, even that’s quick. But Barcelona, it’s a big city, yet it’s something that has such unique character depending on what part of the city you’re in. So you can really spend, I mean, you can spend months, but you can spend at least a week just in the city, kind of going neighborhood to neighborhood, taking in the local culture of each part of town, seeing some of these excellent museums, eating you’re way through the city. And if you must leave, there are so many fantastic day trips to take. Chris: Before you leave? We haven’t even done the city yet, we’ll get to that. [laughs] So let’s back up and do a little more detail. So you mentioned fantastic neighborhoods. So what neighborhoods should I see? Let’s start with your favorite neighborhood and we’ll go from there. Lauren: Wow, let’s see. I would have to say that my favorite neighborhood is the Gracia neighborhood, in the north of Barcelona. And it’s a neighborhood that used to be a village, so you have this interesting history that it used to be completely separate from the city and then after the center of the city had to be expanded because of plagues and because of illnesses, and they started expanding outwards, they built this whole part of the town called The Eixample, The Extension, and this part is very grid like, very kind of wide avenues and boulevards. It’s where a lot of the modernist architecture is. It’s gorgeous, but it connects old Barcelona to the Gracia village. And so when you go to Gracia today, you still get this very village-like feel and a lot of the locals there, the shop owners, the restaurant owners, they kind of refer to their area still as being separate from Barcelona. And many of them have lived there for their whole lives, they’ve had their grandparents there, their great-grandparents there’s just a, it’s a way to almost go out into the kind of country side of the Catalunya, yet you’re still in the middle of Spain’s second largest city. So I really like that neighborhood because you get this really great combination of what Catalunya, the region where Barcelona’s the capital, is all about. But at the same time you’re in a huge, very international, modern city. Chris: Okay. I don’t have a clear picture of the neighborhood. You say, it’s more like a village, and I also don’t know if I’ve ever been there. You’re mentioning a name that is unfamiliar to me. Are there well know things in Barcelona that are in that village? Lauren: You know, it’s right above some of the Gaudi’s most famous buildings, so the Casa Batlló and also the whole Passeig de Gràcia is where you have a lot of these really exclusive designer shops, a lot of really nice cafes. But then you get out of that part of town, that kind of more classy, posh part of town and you’re all of a sudden in an area that today is very boutique-y, very artsy, and it’s all small shops, small boutiques. You’ve got antique stores, thrift shops, and you’ve got all sorts of international restaurants, where you might have sushi and Mexican and Venezuelan. But then you have right next door all of the very traditional Catalon bodegas, bars, restaurants, ones that you really can’t find that much anymore in the Gothic quarter, for example, in the center of Barcelona. But if you do go out to some of the neighborhoods like Gracia, that used to be their own villages, you’ll still find them, so you get this really interesting mix. And the neighborhood itself is known as being very quaint because the streets are very narrow compared to a lot of the rest of the cities. You’re coming from that Eixample area where the streets are just so incredibly wide. And then you go into this tiny little neighborhood where it’s kind of, you can’t walk on the street if a car’s coming. And it’s also cool because you have a lot of single family homes that are quite old and so they’re kind of really interesting because you’re in the middle of this huge city, where known for apartment living and all of a sudden you’ll start to see these beautiful two-story, colorful, family homes and well I just imagine what would it be like to own one. Chris: Now you had mentioned that there were boutiques and there were restaurants. Any specific shops or restaurants you want to mention before we move back to something else you mentioned? Lauren: There are so many. That area has one of my favorite markets, it’s the Abaceria Central and it’s actually older than Barcelona’s most famous market, The Boqueria and it’s got so much character, so I’d recommend taking a stroll through that market, picking up ham and cheese and olives. And then there’s a couple of great restaurants right in that area. There’s one called Lancho Veta, and it’s a little Catalan tapas bar that does, in my opinion, the best bomba in all of Barcelona, which is kind of the croquet filled with meat and it’s covered in a spicy chili sauce and also and aioli mayonnaise. Chris, there’s a lot of places though, you really can’t go wrong. Chris: Okay. And then you have described it as just north of the area with all the Gaudi’s buildings and we haven’t talked about who Gaudi is or what a Guadi building is. So let’s go back and do that next. Lauren: Yes, so obviously, Gaudi, Catalunya’s most famous architect. He has a lot of his buildings in that area, the Eixample, and he also has one in the kind of the border of La Eixample and Gracia, it’s called the Casa Vicens. And it’s kind of a hidden gem because it was one of his earliest work, one of his earliest commissions, and it’s been closed for many, many years as a private property, it was privately owned. But just this year it’s opening to the public, so it will be the first time that people can go inside that Gaudi building and we’ll see how much it costs to get in, but knowing the price they charge for most of the Gaudi’s it won’t be cheap but it’s probably definitely worth it. Yeah, Gracia is kind of, if we’re talking about Gaudi, in between kind of his most famous buildings. So you get to see the Casa Batlló and then you have, that’s below Gracia, you have the Sagrada Familia to the right of Gracia. Chris: Which is the cathedral, the unfinished cathedral. Chris: May never be finished. Even though Gaudi died in the early 1900s I want to say, they’ve been working on this cathedral for not quite 100 years, but don’t hold me to that date. Do you happen to know the date off the top of your head? I will look that up. Chris: Let’s take a break here and hear from our sponsor who is Select Italy. Select Italy is the ultimate source for travel to Italy and offers a wide array of superior Italian travel products and services, including customized itineraries, fascinating tours, romantic wedding or honeymoon trips, unique and fun culinary classes, yacht charters, transportation, hotel reservations, villa bookings, tickets for museum and musical events, and more. Anything and everything you need for optimum travel to Italy is possible with Select Italy. Their helpful travel planners in Chicago, New York, and Shanghai are always ready to give the best advise on when and where to visit, while the Florence support staff is there to help should you need anything while you’re in Italy. Always eager to introduce their client to new destinations, the company has expanded it’s offerings and travel services to the Balkans with the launch of Select Croatia. Visit selectitaly.com and selectcroatia.com, and thanks to Select Italy for sponsoring Amateur Traveler. Okay, so here’s a challenge for you. I have seen the cathedral, I’ve seen the buildings that you’re talking about, except for the one that you’re saying is just opening up. Can you describe these in words for somebody who doesn’t have a picture in front of them. What does a Gaudi bulling look like? 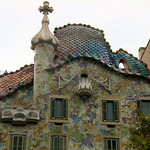 Lauren: A Gaudi building looks like nothing that you ever really seen before. So it looks like it kind of belongs in an amusement park. You almost don’t think it’s actually a serious church or maybe a serious residence, some of the buildings are residences for people to live in. But the modernist architectures that he is known for is just kind of so interesting. It combines all these different styles and the Segrada Familia is just, you can look seriously at every little inch of space and find something new. It has so many symbols, so many different geometric patterns. It’s just something you have to kind of have to experience inside and out. Chris: [laughs] Let’s try this, I think that sometimes, his buildings, one of the things is there are not a lot of straight lines, and it has a sense that it all almost grew there, almost like a mushroom. Lauren: Yeah, that’s true, a lot of nature elements. Chris: The Sagrada Familia, a lot of the spires have fruit on the top and things like that and if you look at the columns inside, very much a sense of nature and connection to nature. Or nature maybe done by Dr. Suess sometimes. 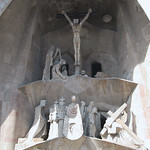 And then you mentioned the different are on the outside and that is quite varied, because one of the Sagrada Familia, one end of it, for instance, the nativity, has more of a classical sculpture style, while the crucifixion end, at the far side, is cubist. A very interesting, I think, cubist crucifixion scene. Very, very different. But I love Gaudi and I think it’s one of the things we really enjoyed about the city. The buildings that you mentioned as well as the park that he did in that part of town. Park Güell I want to say? Lauren: Park Güell, exactly. That’s right above Gracia. And what’s interesting about the Park Güell is that it wasn’t made to be a park, it was made to be a residential area. So that was just supposed to be the grounds of people’s condos or apartment buildings, and later on it was taken over and made into the park. Which is a great place to just kind of escape from the rest of the city. It’s one of those areas that’s kind of above the old Barcelona, so you get a great view and there’s a part where you have to pay to get in. Nowadays that’s changed, actually in the past couple of years. There’s a whole other park where it’s just opened to the public every day. So if you want to see the really colorful benches and all of that, that’s what you have to pay to see. But other than that you can kind of go into the actual nature part of the park for free, which is something a lot of people don’t realize. Chris: And when when you were talking about the neighborhood that you like, you compared it to, for instance, rhe Gothic neighborhood. What is the Gothic neighborhood and what will I find there? Lauren: So the Gothic neighborhood, along with the Born neighborhood are Barcelona’s oldest neighborhood’s, where the city first started 2.000 years ago. And the Gothic quarter is where you are going to find Roman ruins, you’re going to find the majority of the city’s museums, you’re going to find all sorts of tapas bars, a lot of them not so great, a lot of them are tourist traps. And then you’re going to find, of course, as you are going to the Gothic quarter and into the what we call the Duval neighborhood you’ll find the Rambla de Catalunya, which is the main street and that’s where you will find the Boqueria market and a lot of the must see Barcelona moments that are in all of the guide books, the street performers. But that area, especially in recent years, has become very, very touristy. And a lot of the classic places have shut down or changed management and it’s just become very chainy. So of course there are still some authentic places, some gems, but it’s an area that, it’s difficult to really get to it’s core. If you just went there, you would think that Barcelona was about paella and sangria and neither of those things are typical to have in Barcelona. So I always encourage people, see that, do that, definitely take a walk down that area, but you definitely have to venture out. Now the Gothic quarter is just a feast for the eyes of the architecture that’s kind of surrounding you at all times and the narrow little streets, all the shops are built into these beautiful kind of arches and that also goes into another neighborhood called the Born, which a lot of people don’t realize is not a part of the Gothic quarter. And the Born is another beautiful neighborhood that has one of my favorite things in all of Barcelona, a Church called Santa Maria del Mar, which is absolutely beautiful. St Mary of the Sea. And the Born is kind of, some people would call it a less touristy Gothic quarter. But they’re both, I mean, they both have tourist because they are both beautiful places to visit. But I think that both are worth getting into, not following a map, not just going where the guide book says, but just going down these little streets and little alleyways, kind of just discovering the beauty of these quite touristic quarters, nowadays, are sometimes hidden away but they’re still there. Chris: Excellent. And when you talked about Roman ruins, you may have surprised a few people with the age of Barcelona. Barcelona is more than 2,000 years old as a city, obviously not all of it, as you talked about it expanding in different areas. Built not originally by the Romans but by the Carthaginians. Either built by Hamilcar Barca the father of Hannibal or, as I believe the legend says, by Hercules. I tend to go towards the first one because that’s who it’s named after, but yeah, an old, old city. Lauren: It’s a very old city. But you can really see it because there’s a lot of preserved ruins. If you go to the city’s history museum, which I think is potentially my favorite museum in the city, you get just an amazing glimpse into the past of Barcelona. They do a really fantastic job at kind of telling the story of the city throughout the years. And you can actually walk directly over all of these Roman ruins that have been preserved underneath the museum. So I think it’s one of those places that it’s not just reading the descriptions and seeing the photos, you’re actually living what you can imagine life was like by actually being immersed in these ruins. You see a lot of old fish salting vats, where they’ll made fish sauce in ancient Rome, and you see a lot of ruins that are really interesting. Chris: Excellent. Now you mentioned that that was your favorite museum, what are you comparing it with? What are some of the other museums we should be aware of in town? Lauren: Well there are a lot of museums. There’s a chocolate museum, for example, and it’s pretty interesting. Barcelona was big in the chocolate trade after the new world was discovered, yeah. Yeah, definitely. And I mean there’s also the Picasso museum, which of course, anyone who’s a fan of Picasso, loves to stop by and loves to spend a few hours in. There’s a Mammoth museum because Barcelona was also a place where the Mammoth’s actually roamed. Chris: Not that they were after the chocolate. That was somewhat earlier. Chris: Those are your favorites? Okay, excellent. And then by the way, getting back to a fact that I was looking back earlier, the ground breaking for the La Sagrada Familia was in 1882, so basically they’ve been building this cathedral off and on, obviously, for a 134 years. Lauren: Yeah, we’ll see if there’s ever going to be a finishing date. Lauren: I’m really a fan of kind of seeing the good in everything, so even the most touristy part of town, Las Ramblas, I think has something to see and it should be experienced, but maybe not spend too much time there. Chris: Tell me what we’re seeing or not seeing when you talking about the most touristy neighborhood. Tell people what that is. Lauren: Yeah, so Las Ramblas is one of the main avenues of the center of Barcelona and it’s where you have the Boqueria market, it’s where you have all these people doing kind of street performances. Chris: Especially at the southern end of that near the Columbus Monument, in my experience, is where you’ll find a lot of the living statutes and such. Lauren: Yeah, towards the water. You’re going to find a lot of people pedaling different souvenirs and a lot of ]inaudible 00:19:46] places that aren’t actually traditional. But it is a place that has still a lot of character and it’s something I think that everyone should talk a walk around, especially the market area’s really cool. But when you venture off from that area, I would recommend going to a couple of different places. There’s the neighborhood called Barceloneta, which is basically a sandy strip of land that makes up this fisherman’s quarter, which is really interesting because a lot of people only walk along the boardwalk, which is where you’re going to find of course a ton of restaurants and a lot of paellas. Not many people actually venture into the neighborhood and the neighborhood is filled with really authentic tapas bars, authentic places to see music, authentic kind of places to have a drink in Barcelona. Chris: Do you have a couple of those you’d recommend, since you’re calling out some of the better ones? Chris: Oh, okay, that I never realized. Lauren: Yeah, you have that, you have some tapas. Another place that I really like is called Cal Papi, which is a place to have kind of just the fresh sea food of the day and Barcelona obviously on the coast is a great place to have all sorts of prawns and different fish and calamari, muscles. It’s one of the best places in that neighborhood to just have a very simple, but delicious fish meal. And then there’s a bodega that I would really recommend, it’s called L’Electricitat, The Electricity, and it’s a really authentic Barcelona style bodega which means that you drink vermouth from the tap and you eat all sorts of sea food, tapas, all sorts of canned sea food, and like sea food and mayonnaise salad, and again, a really simple, simple place but it’s just a fun place to hang out for a few hours and drink a vermouth or two and have some tapas. Chris: We have a problem here. When I talk about a bodega here we’re talking about a small market, but when you’re talking about bodega there, you’re using a word as a restaurant or, what’s the difference between a restaurant and a bodega? Lauren: Yeah, so a bodega is a place in Barcelona that used to and sometimes still does sell wine in bulk. So normally they’ll have actual barrels in the restaurant or the establishment, where people will bring their own bottles, which sometimes are just plastic, water bottles that have been emptied out, and they’ll buy wine by bulk. And why they’re there they’ll have a drink or two. And usually some very simple tapas or bites that don’t involve a hot kitchen. So a lot of bodegas in Barcelona, they don’t even have a license to serve hot food. So you’ll find a lot of canned food which is definitely not a bad thing in Spain. Canned food is a delicacy and it’s some of the best stuff that you can get. Some of the most expensive stuff as well, muscles or clams, anchovies, and you’ll usually drink in Barcelona bodegas, vermouth, which is a fortified white wine. Chris: Okay. So bodega means winery, but it actually gets used that way in Barcelona where here in the States, we’ve transmogrified it to something that’s completely different. Lauren: Yeah, I didn’t realize, I don’t shop in the states, I didn’t know that. Chris: Yeah, when you talk about a bodega here in, especially in California, it’s a small local, usually Spanish market that may or may not have wine. So it’s a different meaning here. What’s going to surprise me when I get to Barcelona? Lauren: Well what surprised me when I first came to Barcelona as a student back in 2007 was that it was a lot bigger than I expected. A lot of times the image I’d had of this Mediterranean port. I was thinking this small picturesque little kind of touristic pretty port, and that’s not what it is. I think the first time I visited, I was almost disappointed. I was overwhelmed at how big the city was and how not every part of it was beautiful. But every time I’ve gone back and spent significant time in the different kind of neighborhoods, I’ve just fallen in love with the fact that it’s such an unique city, because you have kind of the best of that charming, small town, small coastal village, European beauty. But then you also have this thriving metropolitan city, where you have such interesting art, you have such interesting culture, food. You have a lot of international influence as well, and it just mixes together and somehow works. It’s just, I think it’s a fantastic city, too. I’ve always wanted to live there and I never have from more than a months time, but even as a visitor, it’s just a city you go back to time and time again and really always find something new, which is just I think an amazing thing. Chris: Well, and you mentioned being a port city. My impression is, I was there for the first time I think in around 2000 and my impression is that really until the Olympics in ’92, like so many cities, it had really turned its back on the water in a sense that there were a lot of things that you could do on the water besides it being an industrial port. And much of that development there that is now down by the water is relatively new. More than 10 years old now, almost 20, but that is a lot of the new things happening in the city, a lot of the changes have happened down there. Lauren: Yeah, absolutely. There’s a whole great neighborhood called Poblenou and that neighborhood is right close to the port where they developed fore the Olympics, and I would say it’s probably one of the most up and coming parts of Barcelona, where you’ve got a lot of modern restaurants and wine bars and really fun places, yet at the same time it’s not that tiny kind of claustrophobic center of the city, where the streets are small and there’s a lot of tourists. So if you’re looking to go somewhere again, it’s more residential, but also still really interesting, that’s another neighborhood I would recommend walking around or finding a couple of restaurant recommendations and just checking them out. You’ll get a real feel of how it is to live in Barcelona, because a lot of people would, I think would choose to live in Poblenou if they could. Chris: Interesting. At one point you were talking about the things to do outside Barcelona and I want to get there also, but are there any other neighborhoods you want to talk about before we do that? Lauren: So you have great coffee shops, great cafes, really funky co-working spaces, and then that kind of leads into the Poble-sec neighborhood which was another mostly immigrant neighborhood, and that’s what has become very famous in recent years, because Ferran and Albert Adria were arguably Spain’s most famous chefs, and two of the most famous chefs in all of the world. Adria was the creator of El Bulli, and they’ve kind of made their little mini restaurant empire in this neighborhood in the past 5 or 10 years, they’ve developed a bunch of different restaurants. So they kind of put it on the map for real estate and a lot of people have moved into that neighborhood with their restaurant concept so it’s become a very trendy place, especially at night, to go out and go kind of on a tapas crawl or pinchos crawl and just have a good time. So I’d recommend Poble-sec especially at night. Chris: Excellent. We mentioned that you can go to Barcelona any time of the year, but is there a particular day or particular time that you think is the best time to be in Barcelona? A festival or a season? Lauren: There’s two times a year that I would personally choose to go to Barcelona. I would choose November because the weather is just usually the best of the whole year. In the 70’s or the high 60’s, just beautiful, beautiful weather. And a lot of the traditional winter foods are coming out, like roasted chestnuts on the streets, even though it’s still really warm, it’s a lovely time of year. And then I really like right now actually, January, February, because we have a very traditional Catalon tradition called Calçots which are these onions that they barbecue in Barcelona city and also in a lot of country sides surrounding the city. And they do these huge Onion barbecues and then everyone dips these very, very long onions into this sauce called Romesco Sauce, and it’s a very messy thing, you have bibs. And after that, after each person eats like 40 of these Calçots, I don’t think you could eat actually 40, but you have a big barbecue. So this is a very traditional thing that only takes place, pretty much from late December to mid-February because that’s the season that these onions grow. And it’s just completely immersing yourself in Catalan tradition. Because you go to one of those things and it’s just such a cultural experience, you see everyone, all the locals having so much fun. It’s what they do every year, so it’s like their, almost like their thanksgiving type of thing. Once a year you have to do this, you go out to the Calçots with your family. So it’s a really interesting time to be there and it’s usually good weather, too. This past week has been unusually warm, but in the 70’s, so it’s pretty warm. Chris: Excellent. One warning you would give before somebody goes to Barcelona? Lauren: You do need to watch your stuff. Chris; Okay. I was going to say it if you didn’t say it, especially when you were talking about Las Ramblas, I’m thinking, we haven’t said that yet. Lauren: Exactly. I mean I hate to quote any of the negativity about any city, but it is true, that there is a high percentage pickpockets in Barcelona, usually petty crimes, and if you are walking around with your purse or your bag open or you leave your camera on the window sill of a restaurant, it probably won’t be there in a few minutes. So you do need to be careful. But if you are careful, it’s going to be fine. Just talking caution when you’re out with your things. Chris: Yeah, and I think it’s true, especially in any major European city I would do the same. But Barcelona, certainly some parts of it have more of a reputation than others. Excellent. You mentioned getting out of town, where would you go and take someone to get out from Barcelona and explore just a little further? Lauren: My Favorite day trips from Barcelona are Girona which is on the coast of Brava. Chris: And we’ve actually done a whole show on Costa Brava; beautiful, beautiful area. Lauren: It’s absolutely lovely and Girona is a gorgeous, gorgeous city. Lauren: And then I love Cadaqués, and that is where you find Salvador Dalí’s home, his former home. And so it’s kind of a house-museum which it gives you a really interesting glimpse into to who Dali, one of the Catalunya’s most famous and acclaimed artists, really was. So that’s a really interesting experience. And the village itself, Cadaqués, is just super picturesque. Little boats, little fishing boats in the little port and it’s just lovely and a place where you can really, I think disconnect from the buzz of the big city of Barcelona for the day. So Cadaqués is a beautiful place where you can just really, I think, you feel like you’ve really escaped the city for the day. I really recommend those two places. If you’re into wine, Barcelona is surrounded by Catalunya’s wine country. And if you like sparkling wine, you’ve got Cava Bodegas, which would be wineries in this case, surrounding the city’s wall. And those are, a lot of them are accessible by trains; so I know a lot of people can’t rent a car when they’re traveling because either they don’t have a license or because they’re uncomfortable with it. And the great thing about Barcelona is that you can get to so many places by train or even by bus that you really don’t need to rent a car. Of course if you can, it’s great because you can stop at multiple places in one day, but then again you can’t probably drink at the winery so there’s pros and cons. Chris: Excellent. As we start to wrap this, before I get to my last four questions, anything else we should know before we go to Barcelona? Lauren: There’s great shopping. That’s something I didn’t really touch on. I’m all about the food, but at the same time there is such great shopping. Barcelona, moreso than I think any other Spanish city I’ve been to, just has such a variety of little boutique shops. Whether you’re into fashion and clothing or quirky little kitchen goods, or household goods, you have a lot to see and a lot of potential damage to do to your wallet. And then also, Barcelona has some great festivals. They have La Mercè which is a fantastic yearly festival. It celebrates one of the city’s Patron Saints and you’ve got all sorts of interesting parades, you’ve got all sorts of these kinds of fire shows that they do in Barcelona. And in the Gracia neighborhood specifically, the neighborhood I was talking about earlier, they have the Fiestas de Gracia, which are in August and they are the Gracia neighborhood festivals. And they decorate the streets into these incredible displays of papier-mache art and if you Google these things, it’s going to be a lot more impressive than how it sounds because it’s just, the streets have been turned into, each street has a theme and so these different neighborhood associations will plan out the whole year to make the street as like a jungle, or the sky, or something like that, and it’s really impressive. So if you like to party I would definitely head over to Gracia in August for a really unique experience. Chris: You say that one was in August and the other festival that you mentioned was in? Lauren: So La Mercè is in September. Chris: Okay, excellent. You’re standing in the prettiest spot in all of Barcelona. Where are you standing and what are you looking at? Lauren: I’m very partial to the port. I love the ocean and there is the part of the port that has all of the beautiful sail boats and you’re just staring out into the Mediterranean, and especially if you can hit it around the sunset. For me it’s just kind of the essence of being in Barcelona, because it’s sometimes easy to forget when you’re in Barcelona, that you’re actually close to the sea. If you go up to the north of the city, you feel almost as if you’re in the mountains. So I think it’s pretty amazing to be able to be somewhere in the middle of a bustling city and then you can watch the sunset by the ocean. So for me, I would say the port. Chris: Now you mentioned watching the sunset, but you’re facing east, so the sun is actually setting over the city. Lauren: It’s still a very pretty sunset. Lauren: The Christmas Ornament, which is called Caga Tió, it’s basically a little man doing his business and it’s traditionally always put out in a activity scene, and especially little children, they get a real kick out of seeing this, hiding it in their nativity scene. Chris: When you say doing his business, [laughs] we’ve cut out some versions of this to keep this show clean, but he is defecating. Chris: Okay. [laughs] That is odd. Lauren: And so the kids will kind of just look after him at the nativity scene, they think it’s very funny, they feed them a little bit of candy and oranges if they’re really into the nativity scene. And then supposedly, you’re going to get more Christmas presents because he is going to produce more Christmas presents if you feed him well. So the whole thing’s a bit strange. But you will see a lot of those and you’ll see a lot of celebrity ones. So you’ll see a lot of very distasteful people kind of dressed in the same exact way. Chris: Well, moving on. [laughs] Here’s this thought, you really know you’re in Barcelona when, what? Lauren: You’re just on a terrace enjoying some sort of food and some sort of beverage and just kind of people watching, I think that’s the best thing that you can do in Barcelona, is just take a break, enjoy the food, enjoy wine, enjoy the weather, and be outside and watch what happens. Chris: And if you had to summarize Barcelona in just three words, what three words would you use? Lauren: Dynamic, beautiful, and alive. Chris: I would have put good money on you saying delicious since you’re coming to us from Devour Spain, but excellent! Thanks so much. Lauren: It is delicious as well. Chris: Our guest again is Lauren Eloise and Lauren, where can people read more about your travels? Chris: Excellent. And tell us a little bit about Devour Spain as long as we’ve got you here. You do food tours? Lauren: Yeah, we take people around on really local food tours in Madrid, Barcelona, and Seville, and we kind of just try to immerse them in some of the things that we’ve talked about in this interview today into the local cultures and get them away from the fake paella and watered down sangrias and actually drinking the vermouth and eating the food that the locals eat. So it’s a fun way to see the city, definitely by your stomach, and also get some of the history and the culture of the city. Chris: Excellent. Well thank you for coming to the show and sharing with us your obvious love for Barcelona. Lauren: Thank you so much for having me and I hope everyone visit Barcelona soon. Thanks Jerry. I certainly do intend this show to be for people who do travel to try and get you on the road, but obviously some people who listen to the show are using it in fact for many years, I’ve been using it to travel vicariously through the guests so thanks for your kind words. I also heard from Nir who said, “I really enjoyed the Maldives episode. I think you both did great managing to talk so much about a place where there is nothing to do. Keep up the great podcast.” Yeah, I knew that the Maldives was going to be a shorter show. Some shows, for instance like Barcelona, there really are more things that we’re going to try and compress things in. And sometimes when you’re doing a lie on the beach holiday on an island that you can run around seven laps to a mile, obviously, once you’ve talked about the snorkeling and the scuba-ing, there’s not going to be as much to do. It’s one of the challenges but it’s also one of the things I enjoy about doing this show. I think with that we’re going to end this episode of the Amateur Traveler. There are still a couple slots open for the trip to Cambodia, check that on the website under “Book Travel.” The transcript of this episode will be sponsored by JayWay Travel, experts in Eastern Europe travel. And do check out our new sponsor Select Italy. For more discussion with the community why don’t you join us on Facebook at the Amateur Traveler Page, and as always, thanks so much for listening.